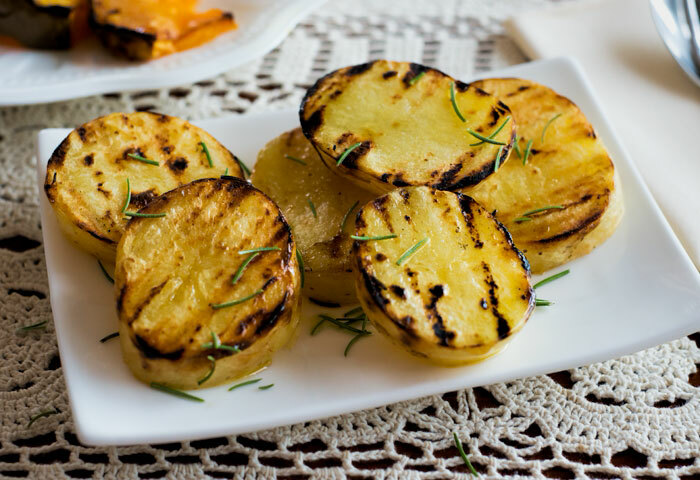 These grilled potato slices look great on the plate and are delicious to eat. Scrub potatoes and slice in ½ inch to ¾ inch slices. Fill a large saucepan with water, the salt, sugar and 2 sprigs of rosemary and place over high heat until water boils, then add the potato slices and reduce heat to a simmer. Cook potato slices for 15 minutes or until fork tender. Remove from water and place on a plate, brush with olive oil, then set aside to cool. When bbq is hot, rebrush slices with olive oil and sprinkle with sea salt, then place oil side down on the bbq. Cook until the potatoes are browned with nice grill marks. Turn over for a minute or so, then remove to the serving plate. Drizzle with olive oil and sprinkle with rosemary leaves.